HomeBlogSpiritualityAre You a Pharisee or Sadducee? In Jesus’s lifetime, there were two major sects in Judaism: Pharisees and Sadducees. Both sects appear in the Bible, with Pharisee mentioned ninety-nine times and Sadducee occurring fifteen, all in the New Testament and mostly in the Gospels. Though Jesus extended love and acceptance to all people, especially those on the outside, he dished out criticism for religious insiders: the Pharisees and Sadducees. As religious people, Jesus pointed out their shortcomings and how their theology was off track. The Pharisees were highly righteous people, focusing on proper behavior with a long list of things they could do and a longer list of things they couldn’t do. They started with the Law of Moses, but over the centuries they greatly expanded it by adding thousands and thousands of man-made rules. As a result, they were highly legalistic. Unfortunately these rules alienated themselves from God, rather than draw them to him. Instead of adding things to what the Scriptures taught, the Sadducees removed things. They reduced their theology. For their faith foundation the Sadducees focused solely on the Torah, the first five books of today’s Bible. The Bible says the Sadducees didn’t believe in the resurrection from the dead. A religion without an afterlife is an empty one. They also didn’t believe in angels or spirits. Most of the high priest and priests were Sadducees but not all. There were also Pharisees within the priestly ranks. Many religious Christians today are modern-day Pharisees, where others are modern-day Sadducees. Modern-day Pharisees live a legalistic life governed by rules for what to do and not do, mostly what not to do. You may have heard some of these rules: don’t drink, smoke, or dance. Don’t play cards, go to the movies, or listen to non-religious music. And don’t use makeup, have piercings, or get tattoos. They also often follow rules about what they must wear and what they do or don’t do with their hair, particularly for women. Modern-day Sadducees, on the other hand, have reduced their theology so much that faith is largely removed and religious practices are ritual and mostly void of spiritual significance. They involve themselves with social causes at the expense of spiritual growth. They focus on their present physical life with little thought to a future spiritual afterlife. I know modern-day Pharisees and modern-day Sadducees. Regardless, everyone should guard against falling into the error of the Pharisees and Sadducees. 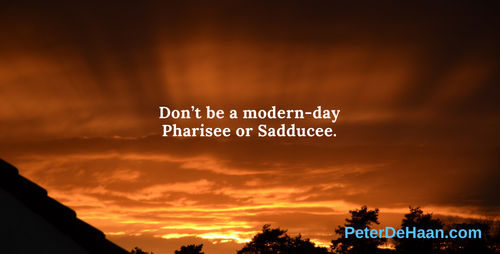 Don’t be a modern-day Pharisee or Sadducee. Be a disciple of Jesus.